Beautiful Paradise Valley/Phoenix luxury condo- golf course views! A stylish newly fully furnished luxury condominium in a gated community with all the amenities of home. Accommodations here are everything you'd expect and more. All new ST ST appliances (large & small), carpet, draperies, paint, and furniture with nice art pieces in each room. 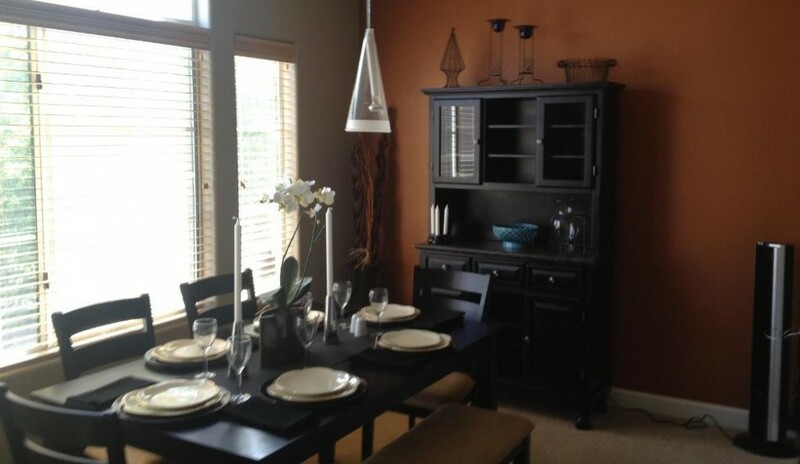 The kitchen is fully equipped with spices, cooking basics, china, utensils, electric pan, Crock pot, great knives, wine glasses, tablecloth, and cloth napkins, and pool appropriate glassware. Three level (two indoor flights of stairs), first flight is from garage to main area (living room, dining room, and kitchen, patios), the second flight is to bedrooms/bathrooms, and washer/dryer. Enjoy spectacular views of greenery while walking on the golf course. Experience the best Phoenix/Scottsdale has to offer, only minutes from downtown Phoenix, AZ. Surrounded by the lush Sonoran desert, while still located close to golf, restaurants, cinemas, shopping, and more entertainment than you could ever imagine. Learn about Arizona�s culture at the numerous Scottsdale museums. Watch and listen to regional, national and internationally acclaimed shows at nearby music and performance art centers. Hike along beautiful wilderness trails, climb Camel back Mountain, and saunter amongst native flora in the Botanical Garden. . River rafting, hot air ballooning, shopping, art museums, the Phoenix Zoo, as well as the majestic Grand Canyon�you will find there is so much to experience in the heart of America�s Southwest. Push the pedal to the floor at a Grand Prix racing school and America�s largest indoor kart racing track. Scottsdale offers an endless list of area attractions. � Two car tandem garage. $ Total rent due at the time of booking, 25% 60 days before arrival and 50% balance due day of arrival.